Transcript, photos, and additional notes follow below. From the Cumberland Gap to the Atlantic Ocean, this is Virginia Water Radio for the week of March 16, 2015. This week, we drop in on a Virginia social gathering during a highly competitive round of “Name Your Favorite Amphibian with a Tail.” Sound too good to be true? Well, just have a listen for about 25 seconds. Those were the names of 13 species of salamanders, out of over fifty species in Virginia and several hundred species worldwide. As the names indicate, salamanders show a variety of regional locations, habitat preferences, and characteristics. Salamanders occur all across Virginia, but the western areas of Virginia and other Southern Appalachian states are considered globally significant for their diversity of salamanders, as well as various other organisms. Salamanders are tailed members of the scientific class called amphibians; frogs and toads are amphibians whose adults don’t have a tail. Many salamander species follow the typical amphibian life-cycle pattern of living on land as adults but having an aquatic larval stage. 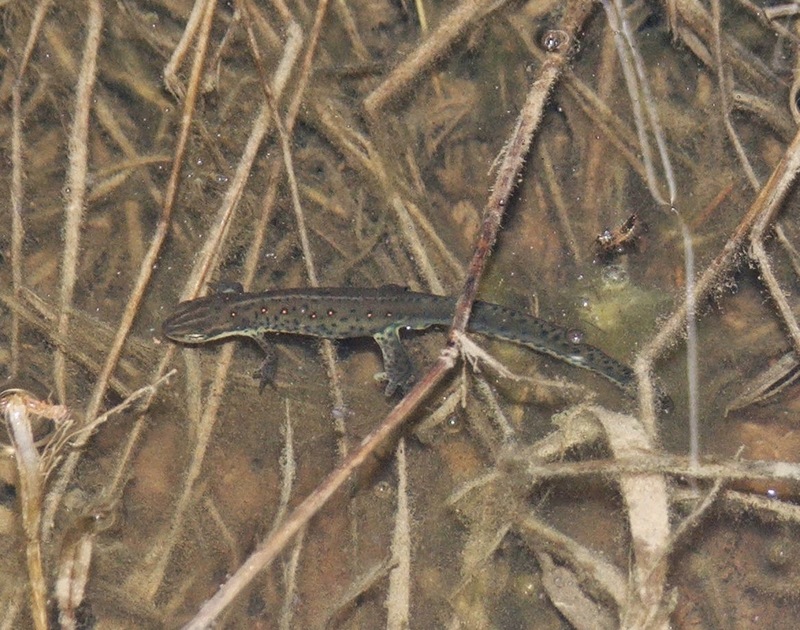 Some salamanders, however, are completely aquatic, while others are completely land-based. Even on land, salamanders require moist conditions to avoid drying out through their skin. Whether in forests, water bodies, or wetlands, salamanders are important components in food webs and other natural cycles, and their presence or absence helps indicate the ecological quality of land and water habitats. And besides being important ecologically, salamanders have some fascinating symbolic roles in human culture. Examples include the inspiration for the political term “gerrymander”; names for several musical groups; crime-scene clues in The Salamander, a 1973 novel by Morris West; and the name of the Salamander Resort & Spa in Middleburg, Va., based in part on the World War II experiences of a former owner if the estate. That owner’s code name was “The Salamander,” because his ability to elude capture recalled the mythology—and word origin—of salamanders being able to survive fire. Thanks to friends in Blacksburg for calling out salamander names, and they get the last word for a diverse, ecologically important, and somewhat mythical group of animals. Red-spotted (or Eastern) Newt in a seasonal pond in Blacksburg, Va., March 12, 2007. Red Salamander, a species found widely in Virginia but photographed here in Great Smoky Mountains National Park in Tennessee, August 6, 2014. Thanks to Carola Haas, William Hopkins, and Donald Linzey, all in the Virginia Tech Department of Fish and Wildlife Conservation, for their suggestions about this episode. Thanks to several friends in Blacksburg, Va., for calling out names of salamander species. Following are the species named (in the order named), along with their scientific names. All are hyperlinked to online information from the Virginia Department of Game and Inland Fisheries’ Wildlife Information/Species Information Web page, http://www.dgif.virginia.gov/wildlife/information/. A Natural History Guide to Great Smoky Mountains National Park, by Donald W. Linzey, University of Tennessee Press, Knoxville, Tenn., 2008. Amphibians and Reptiles of the Carolinas and Virginia, by B.S. Martof et al., University of North Carolina Press, Chapel Hill, 1980. Encyclopedia Britannica, “Gerrymandering,” online at http://www.britannica.com/EBchecked/topic/231865/gerrymandering. Environmental Literacy Council (non-profit organization in Washington, D.C.), “Salamanders,” online at http://enviroliteracy.org/article.php/1469.html. Highlands [N.C.] Biological Station (University of North Carolina and Western Carolina University), “Biodiversity of the Southern Appalachians,” online at http://highlandsbiological.org/nature-center/biodiversity-of-the-southern-appalachians/. “Mythical Creatures Guide” Web site, “Salamander,” online at http://www.mythicalcreaturesguide.com/page/Salamander. National Geographic, “Mudpuppy,” online at http://animals.nationalgeographic.com/animals/amphibians/mudpuppy/.Salamander Hotels and Resorts (including the Salamander Resort & Spa in Middleburg, Va.), “The Salamander Name, online at http://www.salamanderhotels.com/our-story/the-salamander-name. Virginia Department of Game and Inland Fisheries, “Wildlife Information/Species Information/Amphibians,” online at http://www.dgif.virginia.gov/wildlife/information/?t=1. A Guide to the Frogs and Toad of Virginia, by John D. Kleopfer and Chris S. Hobson, Special Publication Number 3, Virginia Department of Game and Inland Fisheries, Richmond, 2011. “All the Salamanders” music video by 7th-grade students from Maplewood Richmond Heights School in St. Louis, while at Tremont Institute in Great Smoky Mountains National Park; online at http://www.themiddleprongpress.com/all-the-salamanders.html. Atlas of Amphibians and Reptiles in Virginia, J.C. Mitchell and K.K. Reay, Virginia Department of Game and Inland Fisheries, Richmond, 1999. “The Calls of Virginia Frogs and Toads” CD, 2008, Virginia Department of Game and Inland Fisheries and Lang Elliott/NatureSoundStudio. For information, see http://www.shopdgif.com/product.cfm?uid=1928838&context=&showInactive=N, or contact the Department at 4010 West Broad Street, Richmond, VA 23230; phone: (804) 367-1000 (VTDD); e-mail: dgifweb@dgif.virginia.gov. Lang Elliott and Miracle of Nature, Inc., Nature Watch Web site, “Spotted Salamander—Migration & Mating Frenzy” video, 3/16/14, online at http://miracleofnature.org/naturewatch/spotted-salamander; and “Snow Trekker—Jefferson Salamander” video, 3/22/14, online at http://miracleofnature.org/naturewatch/jeffersons-salamander; this one to music (no ambient sound). University of Michigan School of Education, “Critter Catalog/Newts and Salamanders,” online at http://www.biokids.umich.edu/critters/Salamandridae/pictures/. “Virginia is for Frogs” Web site, Virginia Department of Game and Inland Fisheries, online at http://www.dgif.virginia.gov/wildlife/virginia-is-for-frogs/. Virginia Herpetological Society, online at www.virginiaherpetologicalsociety.com. (Herpetology refers to the study of amphibians and reptiles. If you’re interested in amphibians and particularly in frog calls, you might want to consider volunteering for the Virginia Frog and Toad Calling Survey, coordinated by the Virginia Department of Game and Inland Fisheries. See information online at http://www.dgif.virginia.gov/wildlife/frogsurvey/, or contact the department at (804) 367-1000. The Virginia program is part of the North American Amphibian Monitoring Program. These programs use the sensitivity of amphibians to water availability and quality as a tool for assessing changes or threats to aquatic systems. For other episodes on amphibians, please see that category at the Index link, http://www.virginiawaterradio.org/p/index.html. Earth Resources: 1.8, 3.10, 4.6. Life Processes: 1.5, 2.4, 3.4. Living Systems: 2.5, 3.5, 3.6, 4.5, 5.5, 6.7 (if I talk about “sentinels”, re: health of ecosystems and conservation issues). Environmental influences and interactions: LS.6, LS.8, LS.9, LS.10, LS.11. Populations, communities, and ecosystems: BIO.8.